JH: Since writing is such a solitary endeavor, the idea of co-writing with a writer pal is very appealing. Bestselling author Jason M. Hough visits the lecture hall today to share his thoughts on the co-writing process. Jason M. Hough (pronounced 'Huff') is the New York Times bestselling author of the The Darwin Elevator and Mass Effect - Andromeda: Nexus Uprising. In a former life he was a 3D artist, animator, and game designer (Metal Fatigue, Aliens vs. Predator: Extinction, and many others). He has worked in the fields of high-performance cluster computing and machine learning, and is a patent-awarded inventor. Last summer I took a risk. For the first time in my admittedly brief career I co-wrote a novel. I say risk because we had a very tight schedule which left little room for that dance that professionals undertake the first time they collaborate on something. Figuring each other out, deciding on the boring stuff of mechanics and process before the actual writing can begin -- all of that was going to have to happen once, quickly, and work the first time. We simply didn’t have the luxury of time to experiment. But let me start with the reasons for co-writing. I’d been invited to write a novel based on the new Mass Effect game. It was an urgent request as the publisher wanted to have a book they could release alongside the game. At the time, however, I had a problem of schedule. I had two books due in the coming year, and only a narrow window in between the two during which I could take on another project. And even that narrow window was too short for my comfort zone. When you get the chance to work on a property like Mass Effect, you want to do it right. Simple as that. So I was faced with either saying no, or co-writing it. If I could partner with someone, we could in theory get the work done faster and meet the schedule. First is the “you write it, I’ll revise it” approach. This is no different time-wise than if you wrote and revised a book yourself. The only advantage to it is that while your co-author is doing their part, you’re free to work on another project. More productive for you overall, but it doesn’t shorten the book’s schedule one bit. Maybe, maybe, you can revise “behind” them, but this doesn’t save as much time as you’d think because you might be revising a chapter that in the end is deemed unnecessary or requires changes from a structure standpoint. In other words, you will likely spend time revising bits that are going to vanish anyway. Same goes for another evidently popular choice, the relay method. “You write a chapter then I write a chapter, rinse and repeat.” Again, you are idle while your co-author works, so no time is saved in terms of the book’s deadline. It just lets you get other things done in between. None of these methods were going to work for us. 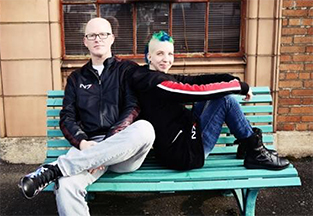 We teamed up for several reasons (Kace, for one, is a walking encyclopedia when it comes to Mass Effect), and we wanted to work together from a purely creative standpoint, but the main reason was that we had to get a book written quickly. It’s important that all parties understand and appreciate this. So how’d we pull it off? Outlining, really. Robust, well-thought-out, chapter-by-chapter outlining. The specifics of our outlining method are pretty interesting to a nerd like me, but it’s probably too much for this article. Suffice to say, Kace and I combined our methods (we were both surprised at how different they were) into a new super hybrid technique. Everything you needed to know to write a given chapter was there, so it didn’t matter if Kace was still writing the previous chapter -- if I was ready to write, I could ‘claim’ a chapter and go. In revisions we fixed any bridging problems between them, but it was surprising how few of these issues we had. Ultimately this allowed us to do pretty much an exactly even split in terms of chapters. Granted, some chapters ended up being longer than others, but I think in the end we probably wrote almost a perfect 50/50 split in terms of word count. Beyond outlining, the other key is communication. We needed a way to bounce questions off one another, share samples, and generally commiserate. For this we used a tool called Slack, which many of you may already be familiar with from your job. It’s becoming very popular for software developers, and we found it extremely handy for our purposes, too. When it came time to do revisions, the situation got a bit more muddy, but in the end it all worked out. We ran into some issues of stepping on one another’s toes because we’d finally reached the point where we were both actively working in the same document (our chapters were all separate documents before this point, only merged into a book at the end). We also fought with some text corruption in Microsoft Word that was scary and frustrating, especially as it only really manifested at the 11th hour. I really, really wish Scrivener had a collaborative mode because the general purpose word processors out there really fall over when a document gets longer than 100 pages or so. Despite these issues, I think Kace would agree that we still managed to divide the revision workload 50/50, or near enough. It’s worth mentioning that we each revised the other’s chapters in our first pass, which helped smooth out any differences in voice. Looking through the finished book now, it’s hard for me to tell which of us wrote a given chapter, which was our goal. The finished product is a book we’re both very proud of, and working together was rewarding in a bunch of ways, both creatively and professionally. I’d do it again for the right project, but I don’t know if I’d agree to a similar schedule in the future. Everything worked out, but it was stressful. To do the same again, with less stress, would be an amazing experience. Titan Books will work closely with acclaimed video game developer BioWare to publish three brand new novels set in the universe of MASS EFFECT: ANDROMEDA. The action will weave directly into the new game, chronicling storylines developed in close collaboration with the BioWare game team. The action takes place concurrently with the adventure of the game itself, setting up the story and events of the game adding depth and detail to the canonical MASS EFFECT saga. great post. AM thinking of doing this with a friend. Will save this if we do! Thank you for this article. My question is how do you manage to have a homogeneous voice all along? And how did you meet?